Organic, biodynamic, and natural wines are getting a lot of attention lately. You may notice “green” tags in the wine aisles, organic and biodynamic seals of certification on wine labels, news articles, and winery websites highlighting their green environmental initiatives in the vineyards and cellar. What’s the difference between all these “green” terms and why you should give biodynamic wines a taste. This month the French Winophiles are exploring French biodynamic wines. We will be chatting about the subject Saturday, January 19 at 11:00 am ET and writing about it on our blogs. A list of the blog posts is at the bottom of this post. In the meantime, check out our host, Gwendolyn Alley’s preview post for our theme on French biodynamic wines here. Organic Wine – Basically, organic wine is made from grapes grown in vineyards that do not use synthetic chemicals like fertilizers, herbicides, fungicides, and pesticides. The focus is on creating healthy soils and a biodiverse environment. The ultimate goal is for stronger, healthier, and more disease resistant vines. However, U.S. and European wines have different requirements when it comes to sulfur dioxide in organic wines. In the U.S. “organic wines” (can carry the USDA organic seal) contain no added sulfites, only naturally occurring (less than 10 parts per million). “Made with organic grapes” (cannot carry the USDA organic seal) is allowed to add sulfur dioxide up to 100 parts per million and must be disclosed on the label. (Conventional/nonorganic wines can have up to 350 parts per million). In the European Union, organic wines are allowed 100 parts per million for red wines (150 for conventional/nonorganic red wine), 150 parts per million white and rosé wines (200 for conventional/nonorganic), sweets wines are allowed an additional 30 parts per million. Biodynamic Wine – Biodynamic wines encompass the criteria of organic wines in addition to, some or all of the principles composed by Austrian philosopher Rudolf Steiner in 1924. Biodynamic farming encourages creating a holistic ecosystem with biodiversity and self-sustainability instead of a monoculture. Also, the planting, sowing, harvesting, and pruning are determined by the lunar cycles. The third principle and the most controversial includes homeopathic preparations made from cow manure, quartz, and seven medicinal plants. Some of these preparations are buried in animal organs over the winter and unearthed in the spring and applied to the vineyards. Certification can be obtained from Demeter and Biodyvin when the criteria are met. Natural Wine – Natural wines have no legal classification or set of standards for operating procedures. In general, they are wines made without additives, chemicals, little or no sulfites, no cultured yeast, and no filtering. They are known to be funkier tasting more sour and yeasty with a cloudy appearance. Three examples of natural wines; Orange Wine, Pétillant Naturel (Pet Nat), and Col Fondo Prosecco. Environmental Impact – Farming with less or no synthetic chemicals is healthier for the soil, environment, people, and the planet. Also, using preparations in the vineyards and following the lunar cycles as outlined in the principles of biodynamic farming makes for stronger and healthier plants in the long run. Health – Chemicals can negatively affect your overall health whether spraying them in the fields, using them in the wine cellar or consuming products that have been treated with them. At the end of the day, when you consume a more natural product how do you feel? Overtime how is your overall health? Terroir Expression – For the taste of a wine to express the uniqueness of where it is grown, having an organic and holistic philosophy in the management of the vineyard and minimal intervention in the cellar, allows more readily for that expression of terroir to show itself. Certification – Biodynamic wines have a set of standards and criteria that must be met to be certified. Deep gold in color. Medium bodied and acidity. On the nose toast, green apple, and apricot aromas. On the palate fresh, chalky, citrus, and star fruit notes. Domaine Zind Humbrecht is owned by Olivier Humbrecht. The estate was organic certified in 1998 by Ecocert and biodynamic certified in 2002 by Biodyvin/Ecocert. Domaine Zind Humbrecht believes that terroir expression is reinforced by cultivating the vines organically and according to biodynamic principles. 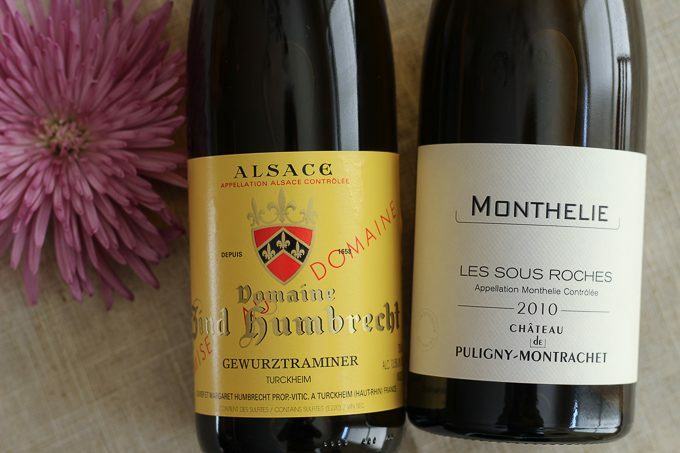 Read about Humbrecht’s perspective on minerality in wines and the biodynamic connection here. Deep straw in color. Medium bodied and acidity. On the nose lychee, rose, and spice. On the palate dry with spicy, ginger, peppery notes. The Zind Humbrecht Gewürztraminer with its dry and spicy elements was a great pairing for the sheet pan dinner of curry chicken and cauliflower, pickled red onions, and cilantro. The exotic blend of curry, garam masala, turmeric, and fresh ginger was matched with the spicy component in the wine. The high-temperature roasting of the chicken and cauliflower were balanced with the fullness and higher alcohol in the wine. The pickled red onions provided a nice palate cleanser along with the acidity in the wine. An easy weeknight dinner. Pairs nicely with an Alsace Gewürztraminer. Preheat the oven to 425º F. Line a baking sheet with parchment paper. In a large wide shallow bowl, combine the garlic, curry powder, garam masala, turmeric, ginger, and coconut oil. With a fork work mixture into a paste. Add the chicken and cauliflower to the bowl and mix to coat the ingredients with the paste. Spread the mixture in a single layer on the lined baking sheet. Roast for 20 minutes, rotating the pan halfway through. To serve, top with cilantro and pickled red onions. In a medium saucepan, combine water, peppercorns, salt, garlic, star anise, coriander seeds, and sugar. Bring mixture to a boil. Remove from heat and add the vinegar, stir. Pour the mixture over the onions. Cool completely and then refrigerate. Pickled onions will keep for a few days in a covered jar in the refrigerator. I think I will have to give biodynamic wines a try! Sounds like an awesome method. 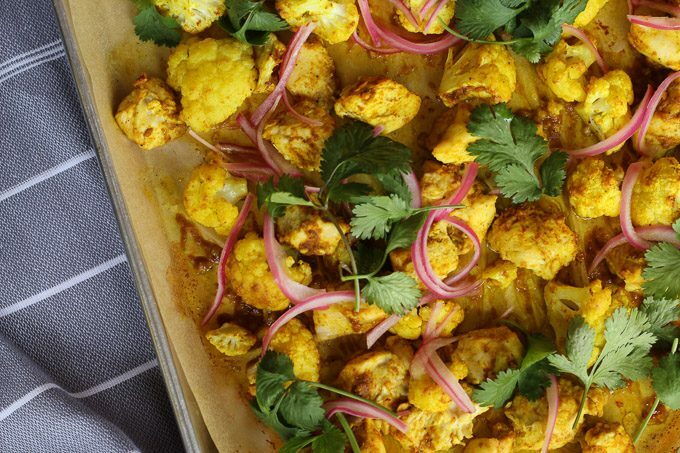 Also the curried cauliflower sheet pan dinner looks delicious! You should give biodynamic wines a try and let me know what you think. 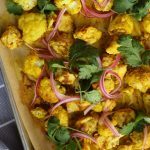 The sheet pan curry chicken and cauliflower dinner is an easy quick weekend dinner with lots of flavor! Oh my but that is a beautiful dish! Clear explanations for this confusing topic. Impressive that the one winery has been certified biodynamic since 2002. All the different “green” wines can get confusing. I do think more environmental awareness in the vineyard and cellar is a philosophy that here is to stay in the wine industry. Yes, it is very impressive that Domaine Zind Humbrecht has had biodynamic certification since 2002! My head was spinning as I was learning about the differences between “green” wine certifications. What nice biodynamic wine finds! I would just love to find a certified guwurtz. They sound scrumptious with the curry pairing. Domaine Zind Humbrecht Gewürztraminer is available on wine.com. Love our choice of wines Jane. A friend of mine did her externship at Zind-Humbrecht and shared many wines. I might be biased but they’re a favorite producer. And I’ve heard about Château de Puligny… your review shares this is one to get! I am guessing your friend learned a lot as an intern at Zind Humbrecht, they were at the forefront of the organic and biodynamic wine movement.I am fortunate to have a great wine shop so close by that can get more difficult to find wines. 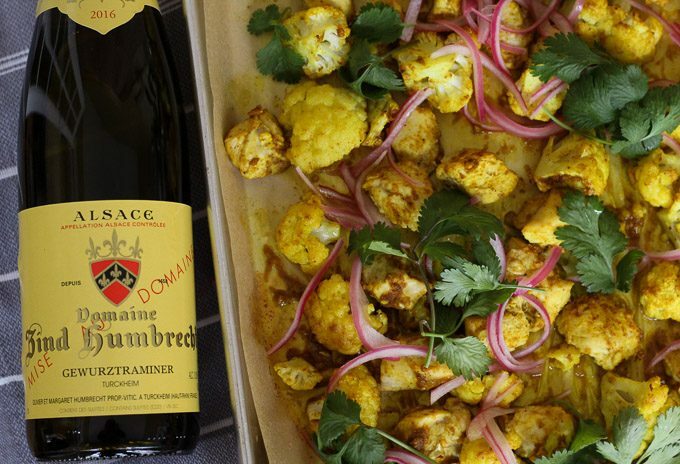 The Zind Humbrecht Gewürztraminer sounds delicious and a perfect pairing with the curry cauliflower! What a beautiful dish. I may try this “sans” chicken. It’s a very confusing topic with many ins and outs. I have to say the Zind Humbrecht wines are a longtime favorite of mine. It looks delicious with the curried cauliflower. I didn’t realize Zind-Humbrecht was biodynamic. What a stunning bottle of wine. This post will be bookmarked and read widely, I’m sure. It’s a fabulous reference.